I have never made it a big secret that my youngest son has really struggled to grasp the concepts of reading, writing, and spelling. We have made HUGE strides in reading skills over the past year or two and he is comfortably reading chapter books like The Weird School with great expression, comprehension, and enjoyment. Through daily reading he's gaining skills and I can see his confidence growing. I no longer hear "I can't read" and he'll often offer to read or take over when I'm reading instructions for other subjects we're working on together. Yet, as much as those reading skills are growing, I didn't see his writing or spelling skills developing as quickly. So I pushed. We have been through THREE spelling workbooks/ programs this year and I was starting to feel like we were never going to be done. We just switched over to All About Spelling level 1 this month and while he flew through the first 2/3 of the book we've slowed down tremendously in the past few weeks. This tells me we're at the level we need to be working on... and yet I find myself sighing, getting frustrated, and wishing we were done with our lessons for the year. My other two boys are DONE and I want a break. It finally dawned on me while doing dishes last night that if I'm feeling this way he must be too and I don't want him to feel stressed, tired, overworked, and begin to hate his spelling time. We are not having any fun at all and while I don't feel that all lessons need to be fun I do try to keep them as enjoyable as possible for both of us. Like a light dawning over me, I realized we needed to take a break! I realized that as much as I stressed about his reading abilities I really didn't push it nearly as much as I'm trying to push spelling on him and I thought about how quickly be began to grow as a reader by leaps and bounds when he was finally ready. I know that as he reads and writes more often spelling WILL naturally develop. He can not continue to grow as a reader if he's not learning to sound out new words, recognize chunks and word families, etc.-- all skills he needs to spell. Spelling and writing will take a bit longer to master since he began reading BEFORE we began focusing on spelling and writing. It will come! I know it will. I realized that we can take a break now and pick up his spelling unit right where we left off in a few weeks when we're both feeling refreshed and ready to jump back in. Yes, he is "behind". Yes he would technically be going into 5th grade this year if he were to attend our local public school, but that also means I have quite a few more years left of having him at home with me that we can focus on these skills and work at a pace that works for us. We don't have to burn ourselves out trying to "catch up" all in one year. That's why we homeschool. SO he can learn at HIS pace-- not mine. I should have realized all of this sooner as my oldest son often struggled with reading, writing, and spelling as well and with just patient, consistent, daily practice (through the school year and not year round) he made huge strides when he was finally ready to tackle those skills. And I KNOW that Evan will too. I need to listen to that tiny voice inside saying... Enough is Enough! I suspect it is something most people struggle with from time to time. It sounds like you've found a program that's working for him and a break for both of you to refresh sounds like a great idea. You are planting seeds as you go and at some point those seeds will grow into a plant as long as it is nourished. You realized that overfeeding and watering can kill it though and you backed off, which was smart. 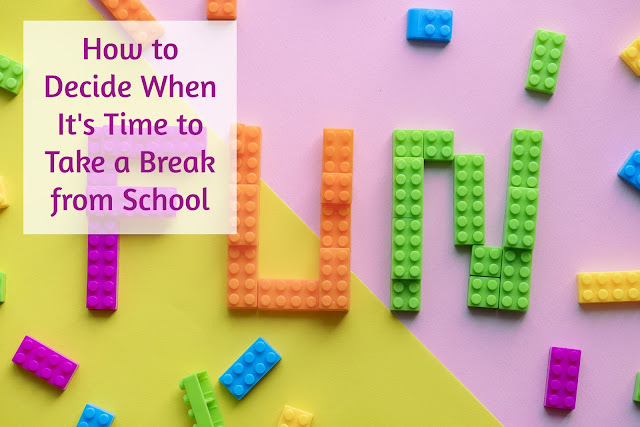 You should celebrate that you found a program that's working and that you saw the signs that a break was needed before you drove your son to hate learning. Thank you! We are both quite happy to be taking our break. I decide the same as you, when we are both getting stressed out! I am learning to be more flexible as the years go by and that is making life and school a lot better! I am also very thankful for your blog. It shows me that they learn in so many different way and that school can look way different than what we think!! Thank you so much for sharing with us! I constantly have to battle against my need to "FINISH" the book/ lessons/ year by dotting every i and crossing very t but I just know that pushing through just to say we finished isn't always as beneficial to the boys. It's so encouraging to see you listen to that inner voice. Sometimes it's hard to let go of the lessons as parents, because we don't want to mess it up for them. Or let them get too far behind. We want to teach them to do hard things and perservere, but you're so right - we don't want them to start to hate school or a subject. Thank you for sharing with us at #LiveLifeWell.